Valdurmon—For when Phoenixmon isn’t intense enough. What’s good about it: Every Digimon has a ability but very few have a ability. Valdurmon not only has both but also an implicit ability! Evolving in the typical way using its evo-bonus gives a heavy Draw 3, which is an immense advantage while a Mega is live. Valdurmon can even continue to draw using its cross ability, so your hand never dies. This Digimon is incredibly defensive with its 1840 HP and Shatter ability combination. In addition, its ACTIVATE is nearly as powerful as the ACE Ground, with an additional Recycle any 5, which can be the end-game gambit for filtering your deck into using your best cards ad-nauseum. The ridiculous Phoenixmon DATA card is valid in this deck. Valdurmon also has a generic Level U DNA, making it pretty consistent even for decks that will have trouble racking 60 DP—which Wind rarely has trouble making. Lastly, Valdurmon’s cross is about as strong as most Level M/U triangle power, which is unique. What’s bad about it: As ACTIVATE abilities go, this one is pretty limited. Being forced to use can delay a safe window for it several turns depending on the opponent. Since its DNA includes a Mega, the Phoenixmon DATA card must be in-hand to skip the 60 DP requirement. Despite being a Ruler, its numbers are overall a bit lower than many 60-cost Megas due to the staggering number of attack abilities and their utility. 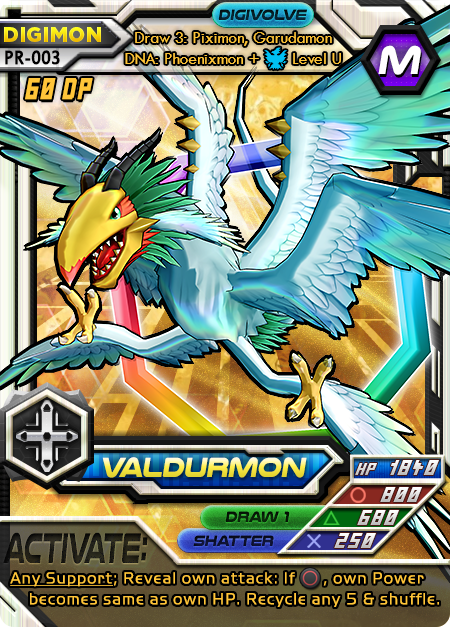 Despite this, Valdurmon has no recourse (such as Counter or To-Zero) against a stronger Digimon with more powerful attacks. Tips: If you want to use Valdurmon without being roped into Garudamon, Piximon, or DNA try using Penguinmon, Love Crest and Moxie to get extra evo-bonuses (Plug-In A isn’t valid for Level M). You could also double the bonus and draw 6 cards! Having a Ruler type means the ability to use Dominion to freely add/remove Types during your turn. Make the best use of this by including Digimon with extra types so as to be able to play Pink D3. Using Phoenixmon DATA for the Data Break can be an effective way to keep your ultimates live and in the game when losing horribly and the prospect of evolving to Valdurmon seems unlikely. The data’s Any Phase also compliments Valdurmon’s two draw effects by making sure your hand size stays consistent throughout the game. Recovery Supports or Evolutions (around +300 or more) are useful the turn Valdurmon enters the field if 1840 isn’t enough Power, which should then be enough to kill most Level U/M in the game. Love Crest is incredibly devastating with Valdurmon and it may even be recommended to use Incubator to search the turn it enters play. Since the ACTIVATE says “make own Power same as own HP“, it won’t matter if becomes the weakest. What might actually matter is if becomes incredibly strong with Shatter (250)! In addition, Love Crest immediately grants an evo-bonus so you can Draw 3 again. One last tip: Valdurmon’s ACTIVATE has one of the most powerful recycles available, in that you get to choose any 5 to put back into the deck. Wind tends to be able to make use of decks that run 1 copy of multiple powerful or situational Option cards, draw/self-trash a ton of the deck, and then put the best cards back in for re-use later. This can effectively make their late game a kill machine. Valdurmon’s recycle is like a turbo charged version of an entire Wind deck archetype. Research—what does the scouter say? What’s good about it: Knowledge of hidden information is a rare thing in Digimon Battle Evolution. Having not only hidden knowledge but also the ability to change your choices based on it is even rarer. The draw effect is just icing on the cake. Since Research can be a proxy, it has added searchability for Partner-centric cards like Partner Finder. Research can help you remain flexible in case of an opponent with specific-attack hate, in case of your own attack-hate being applicable/not-applicable that turn, or other corner cases such as the resolution of Support effects and Activate effects that may change attacks at the last minute. In addition, when you choose a with Jamming, you are allowed to reveal the attack before Supports resolve, void the opponent’s support and Cross-ability, then use Research to change your attack to something like for a devastating combo. What’s bad about it: Like most options, Research is Support-timing only and is mostly a corner-case or utility card that isn’t always going to be applicable. In some ways, it’s also a crutch as a player who’s excellent at attack prediction will rarely need Research outside of special cases. In most cases, confirming what attack you suspect was chosen is far weaker than playing a card to actually capitalize on it, which is where its “utility-ness” can be a drawback. Lastly, there’s a heavy downside in that you may only see your opponent’s choice when your level is lower, which immediately rules out several situations and deck structures. Tips: Research is a card that helps you when you don’t know what to do; If you’re not very good at prediction, it can fill that gap in your skill. The card is strongest when your Digimon has counter (anything), to-zero (anything) or jamming—possibly flatten (specific attack) in some decks. There are times in the game where your opponent can use all their attacks equally effectively. In these instances, Research tends to shine. If your level is equal or higher, Research is most useful on your own turn, as you may be able to benefit from the attack change regardless, especially if their support gives away the choice. This tends to be an excellent choice in a deck that heavily abuses Cross abilities but also low-level decks. Sometimes one of the most effective strategies is playing 3 plus a proxy with several Rookies that have different counter-attack abilities. What’s good about it: Doubles your power and sets the opponent’s to 0, allowing an easy come-from-behind when you lose the evolution race. Since your own Digimon can be any level when used, it can also act as a “get ahead” gambit that preserves your own health while taking a significant chunk out of the opponent. The “If not” case can be really helpful as well, though not as strong as cards dedicated to discarding. Discard 1 can disrupt your opponents ability to evolve, rack DP, Support on the next turn, or even dump them into the dreaded 0-card hand. What’s bad about it: Silver Ball tends to be least effective when your opponent is stalling or losing, which makes it less effective if there’s a significant gap in deck or player strength. Until such time, it’s a mere discard 1 which can be difficult to time properly or prioritize when you should presumably have more impactful effects. Having multiples of this card is therefore not very recommended. Tips: Since, most every deck tries to evolve to Ultimate and Mega Digimon—which are big and hit hard, Silver Ball tends to be devastating when played at the right time. Put one of this card in your deck and most of the time it acts like having a second ACE. It should almost always start in the side pile, so as not to clog the opening hand. Key moments to play this card are when the opponent is Level R or C but has 1 card in hand or when they’re U or M and doubling the power would decrease the number of hits-to-KO. Alternatively, when they’re at Level U or M and their attack would KO. When you calculate potential damage for both players, it can sometimes be better to wait for your opponent to reach Mega. If you can tell the current Ultimate won’t deal a knockout blow and the Silver Ball is close enough to KOing their Mega (they haven’t played yet), try saving it for that instance and net two KOs! 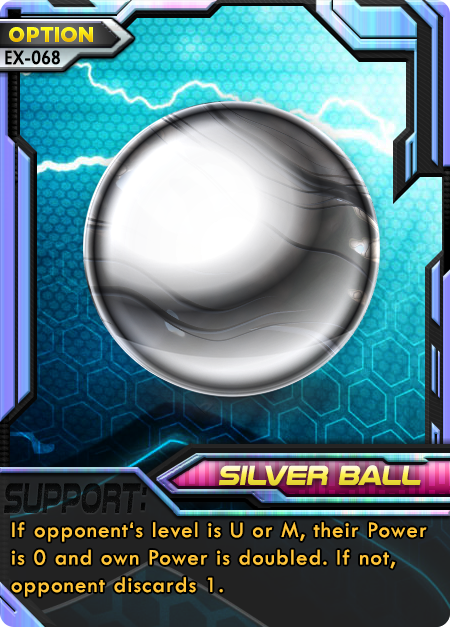 Silver ball is both a sword and shield against the strongest Digimon in the game; as such, it is a tool from which every deck can benefit. Cyclomon and Monochromon—A Double feature of evo-bonus madness! These two dynamos of Evolution are quite similar in may regards, leading to today’s unique COTD. What’s good about them: The evo-bonuses of these two Digimon combine deck searching—one of the strongest effects in the game, with Evolution cards—one of the most powerful cards when used correctly. Both effects tend to be limited but very powerful, which is mirrored by the the Monochromon Cyclomon duo themselves. They add significant speed and consistency with regard to activating evolution effects. Monochromon in particular has a very nice balance in having a strong attack set, aggressive Support, and sturdy health. Cyclomon likewise is even more sturdy, nearly as good of an attack set, though more niche Support use. The Cyclomon support can still be great for attack fixing and the peek beforehand allows using punishing Cross effects. to Zero is a solid Cross ability that both share and with enough of it in a deck, Cyclomon’s support becomes truly horrifying. 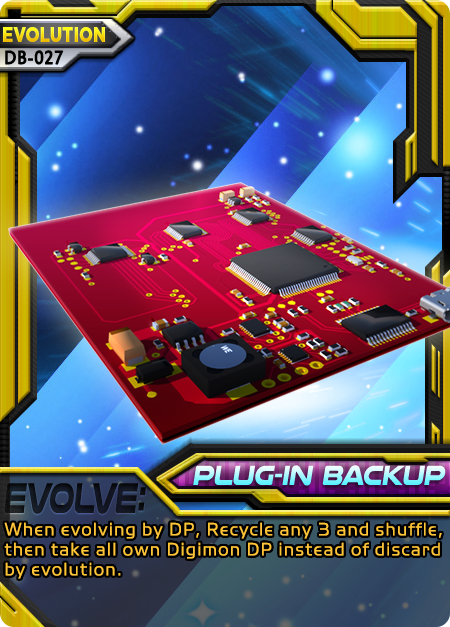 Not only for fast evolutions like Digivice or Super Tag, this evo-bonus helps toolbox utility evolutions like Burst Growth, Meatvolution, or Plug-In A. On top of that, it can search the ACE evolutions Download and Super Evolve, in addition to the Firewall evolve Immortalize! What’s bad about them: Independently, Monochromon’s support is situational to when using Circle and Cyclomon to when potentially wanting to use Cross but only when you’re unsure. Additionally Cyclomon’s Support is limited to Dragon while Monochromon tends to work well in both Dragon and Nature decks. Playing both in the same deck for their evo-bonuses is quite difficult, though this is more of a denial of a super bonus than a strict downside. The evo-bonus is very central to these cards so they lack luster in decks that aren’t tailor-made for their evolution tree, which limits effective deck building. 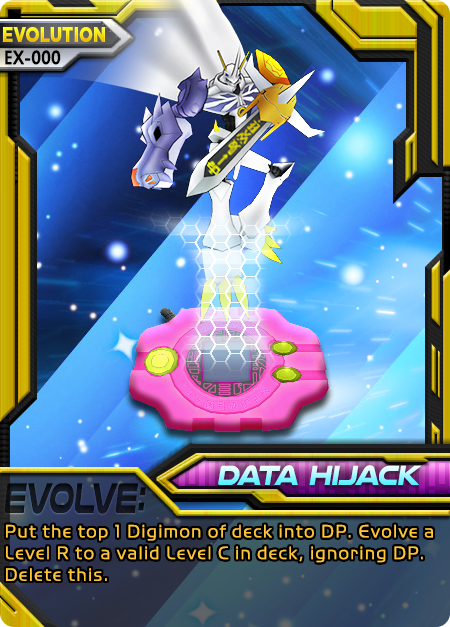 Some evolutions like Warp Digivolve or Data Hijack are a bit less effective simply due to the nature of their levels. Tips: Don’t try to run Monochromon and Cyclomon together unless you have a really good plan. The deck will tend to be unfocused and Rookies will be inconsistent. Losing consistency to gain an effect that improves consistency is pretty counterintuitive. It’s heavily suggested to use a partner that can evolve to one of these, since you’ll get the Evolution search for free and the partner itself can be searched. One of the downsides of Hyper Digivolve is that it’s generally central to a strategy yet limited to 2 copies and that is considerably remedied by this search effect. Don’t forget to re-consider all the evolutions you normally avoid due to limited utility now that they can be searched, in addition to considering obvious choices like Download, Super Evolve, and Immortalize. If you have a single copy of many types of utility evolutions (Incubator, Sniper Disk, Plug-In Backup), you should always have the right tool for the right job, if potentially one evolve-phase late. D-Link in particular takes on new life when used with Monochromon or Cyclomon since it implies all of your Ultimates can be of a different type and it won’t matter (plus they’re cheaper). D-Link would therefore open up many new creative combinations. Dark Evolve—The most tooled version of three other Evolutions. 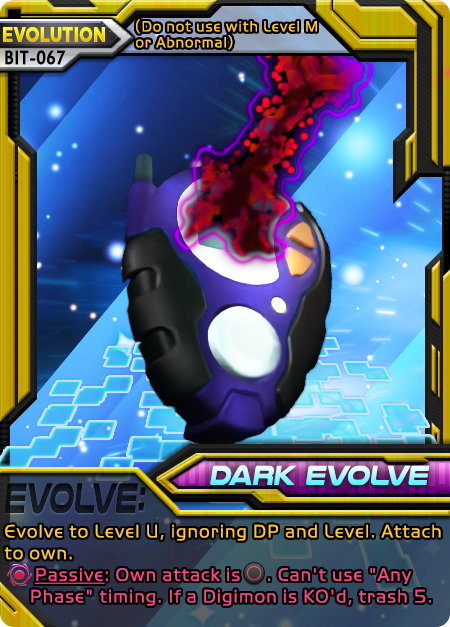 What’s good about it: Dark Evolve works like 3 previously printed evolution cards at the same time: Warp Digivolve, Digivice, and Mutate depending on your current level when played. As a Warp Digivolve replacement, it can take you from R to U (with no DP cost). It’s a Digivice when progressing C to U without DP. Lastly, as a Mutate from U to U and allows abnormal. Since the three aforementioned Evolutions are not always a valid option by themselves, it’s incredibly useful having one in the deck that is always live. Dark Evolve can be used even when you’re abnormal for even more versatility. Since it ignores DP, you get to keep any that was racked. Not for nothing but since it attaches and provides a downside, opposing “Shatter” abilities will backfire, causing opponents to be less likely to use them and also get the damage reduction effect. What’s bad about it: Plan to replace or detach Dark Evolve. If you don’t, the passive conditions are totally devastating. Without a way to remove this attachment, your shiny new Ultimate is defenseless to Counter, Flatten and To-Zero effects as well as every single prediction-based Support. Having someone support with Net Worm and kill your entire hand would be game changing, Ultimate or not. Since it also removes the ability to use “Any Phase” effects, Dark Evolve can significantly limit deck building. It would be difficult to include the ACEs Digi-Diamond and Miracle Ruby, DATA cards (if using the Any Phase primarily), half of Partner Finder and Data Morph (many more), both Super Hit and Moxie will have to be played as Support to attach, and could be voided. While it has one of the use cases from three different evolutions, it doesn’t have every use case. You can’t Mutate C to C or Digivice R to C. This is significant only for the fact that Ultimates tend to be at a lower quantity in the deck and thus less likely than Champions to be in a given hand. Lastly, having to trash 5 when you get KO’d or even when you net a win is pretty steep. That’s a forced full-hand mulligan which essentially means you can’t take a mulligan during a game that Dark Evolve has to stay attached until your Ultimate dies. This is yet another significant restriction but is still a kind of soft-restriction, since you could barrel in head first if you want. Tips: If you play something like Lesson Plan or Nanimon which requires/allows you to discard an attachment as part of its effect, you won’t have to run as many attachments in the main deck to clear a Dark Evolve quickly. In this way, you can technically use those cards (or Support attachments) to trick the opponent into using Circle hate while choosing another attack (don’t get voided!) and Dark Evolve would be removed by the time your attack resolves. Attachment-heavy strategies, like Flatten which uses Letterbox, can make Dark Evolve a tempting Evolution. Be careful of having cards like DarkLizamon, Super Hit, or level Ms that add attachment slots. Since you’re not allowed to remove attachments at-will, these will put you in more danger of having to keep the Dark Evolve. Notice the pattern with deck building and Dark Evolve: don’t bother building an entire deck to cater to it, but many decks can run it without much risk. This goes double for decks that can’t easily search the Dark Evolve since its trash 5 penalty makes it too risky to aggressively find with mulligans. A copy or two in a Monochromon/Cyclomon-heavy deck can be wonderful in theory, due to the evo-box search but consider that a Digivice is strictly better to find in that instance. Cards that change both players’ or your opponent’s attacks like Coliseum and Disrupt Ray help temporarily cover the stopping effects and tend to be good enough to run coincidentally with Dark Evolve instead of as a halfway solution to it. In short, build the deck smart with quick ways to remove the attachment but don’t dedicate a huge chunk of the deck to this card since it’s limited to 2 copies and therefore could weaken the deck overall. What’s good about it: Mastertyrannomon sports a pretty “square” body of attacks, in that they’re all quite closer together in number than other . In a correctly built deck, its support is stronger than an Attack Chip. The evolution box bonus gives unprecedented toolbox power—take any 1 Digimon from your deck! The x3 VS gives the ability to hit Jungle/Nature for 1080 to start, which easily one-shots all Jungle champions and 2-shots all Jungle/Nature Ultimates. With the evobox containing multiple, tightly-grouped champions, a deck that always gets the evobox bonus is easy to achieve. 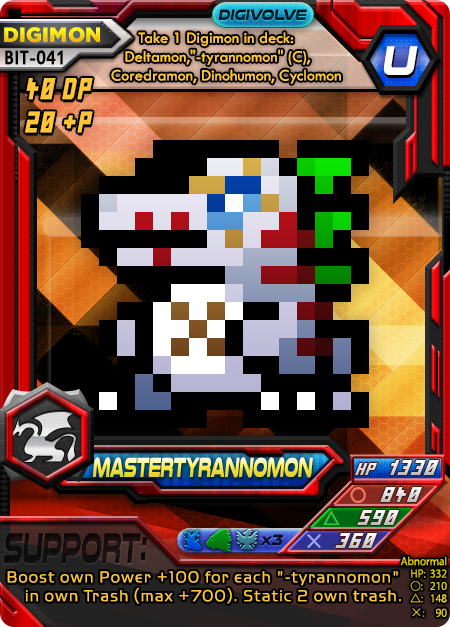 What’s bad about it: Like most , Mastertyrannomon suffers from low HP. In fact, his HP is lower than the average in his cost and type. If you’re not facing Jungle/Nature, his x3VS is just wasted power going unused, which also means he doesn’t have attack hate and therefore can’t protect himself against enemy attacks, which he would be weak to. Given that you usually want only 1 copy of a “hate” card but his support requires you run him around 4, this is an additional downside. His evobox doesn’t include a DP cost reduction, meaning most of the time he takes 2 rack-ups to get, or requires an Evolution card. The Support, while potentially very powerful, scales slowly and requires a certain amount of time or effects to have passed during the game to really be useful. In addition, “-tyrannomon” cards end up having to be in the deck at high numbers, potentially choking other ideas out. Tips: Choose your other Tyrannomon ultimate—it’s not a great idea to only run Mastertyrannomon. Try using Super Evolve to pick Master out of the deck when his x3 VS would be relevant. Since his evobox can take another Master from the deck (for Support), it’s recommended to pack Partner Finder, use the partner evolve to get to Deltamon, Tyrannomon, Darktyrannomon, or Coredramon (any) in preparation. This should guarantee having your powerful support. Master works well with cards that have trash costs such as Mega Disk, Mega Chip, Dark Wings, and occasionally Giga Cannon (though HP can be relatively low in a Tyranno deck). Once a Master’s support is high, it should stay there barring opposing Static effects, so there may be no need for tons of recycle. Try re-using Master supports over and over again for a quick win. If you’re willing to give up evolution to Mega, try running Zeedmillenniumon/Millenniumon with Cyberdramon DATA and Millenniumon DATA: This gives you access to a +800 Power Data Break and 5 selective recycles to re-use Master’s support. Magic Word—A new firewall that stops Any Phase effects and sticks around to void. What’s good about it: If you’re good at attack prediction, this card can gain almost endless voiding of Digimon, which is incredible value. Magic Word also heavily punishes decks that use evolution box bonuses to lower DP costs, which can throw off their entire evolution progression. Any Phase effects can be some of the most flexible and hard to deal with effects in the game since they occur outside of normal play. No more sudden use of Digi-Diamond, Kabuterimon, or RedOtamamon, just to name some. They would have to Support with those effects—the Digimon you can continuously void; the Option you can void by merely trashing the Magic Word! Having the ability to trash it at any time to void Options can make opponents play their Options more conservatively, so it’s always threatening. What’s bad about it: Magic word is a two-edged sword—you don’t get to use “Any Phase” or evolution boxes either. Depending on whose turn it is and what your opponent plays, it can be a played around or voided (on initial Support). Suppose you’re bad at prediction, or the opponent is better: your Magic Word’s usability drops off significantly. This can easily make it worse than any other Firewall. More than one Magic Word at a time is pretty much nonsense unless your opponent supports with an Option so you can trash it. Other firewalls tend to be far more usable one after another. Lastly, Shatter is an attack ability, which this doesn’t void, and it gets rid of Magic Word. Tips: Try to keep your “Any Phase” effects to a minimum. DATA cards may still be worth it, especially since you can dictate the terms of when it leaves play to some degree. Try to ensure your own deck doesn’t require evolution box bonuses for decreasing DP. Try cards that attach directly from the deck! In this way, Tyrannomons can become extra copies of Magic Word in the deck. Love Crest and Moxie are good for decks that aren’t attempting to “double-dip” on the evoboxes, since the deck should be able to evolve fine without them but can get nice bonuses when these are attached instead of Magic Word. “Research” lets you mismatch your attack, guaranteed. What’s good about it: If you’re an expert at prediction and attack-choice punishment, Disrupt Ray can be incredibly potent. This card can be used, with significantly higher accuracy than not, to force a Counter or to-Zero effect, or at the very least save you from a deadly . Don’t forget that this can protect you from a powerful opposing like a Counter/Flatten/to-Zero effect which threatens your own attack, in addition to a one-hit-kill Crash/1st Attack/x3 VS. Replacing itself with a draw is a nice bonus too! What’s bad about it: There’s no fast-and-loose way to specify what attack you want an opponent to use in Digimon. This is on purpose—taking away a player’s choice is heavy handed design and can lead to less mutual exchange of intelligence and tactics; as well as ruining fun for players when you’re making choices for them. 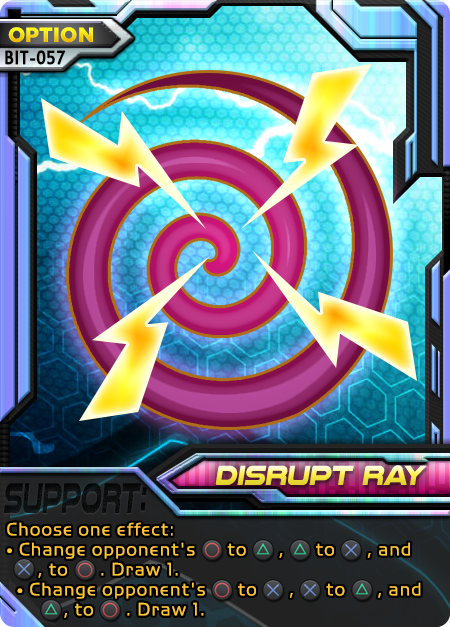 Disrupt Ray is therefore limited in its capacity to change attacks by forcing its player to figure out what the opponent would choose and, if the Ray is still the best card to play in that instance, decide what “direction” they want to rotate the attack selection from that presupposed choice. If the deck playing Disrupt Ray is telegraphing that it does attack changes, opponents can play further mind games to disrupt the disruption. In addition, many situations make Disrupt Ray significantly less effective than simply playing a Recovery Disk or other protection from damage. You have to work hard to get the best use of this. It also doesn’t stop Jamming. If an opponent wants to reveal with Jamming before this Option resolves, they can do it and still Jam your attack ability (not this Option), then their attack will change. This means Jamming effectively gets better if Disrupted. Tips: Don’t tip your hand by being incredibly obvious about your ability to counter or nullify attacks. But the mere existence of Disrupt Ray can also effectively disrupt how an opponent chooses attacks if they know you have it, or suspect, and you respond by not playing it. In that case, you still have the card to play and predicted accordingly. If you absolutely must force a specific attack, usually for Counter, Flatten, or to-Zero, make sure you understand the situation and opponent’s current payoffs. If they are none the wiser and have the ability to one-hit-kill your Digimon with either or , and you have Counter on your , you can safely assume Cross is your best attack, support with Disrupt Ray, choose the bottom option (which assumes they went for the “safer” Traingle-kill) and roll them up to Circle for your counter! Now you take no damage and they take it all. Notice that by being in a weaker position (both Circle and Triangle can KO instead of just the typical Circle), there’s no need to guess what they’re playing. If it’s a Circle one-hit KO and Triangle two-hit KO, you still have to guess whether your opponent values taking you out now, can afford to take you out next turn, or prefers to be unpredictable. Keep these things in mind. Disrupt Ray is also a good choice for decks that need to hit with commonly—and it supports protecting your attack as well as a Coliseum. Often this protects from a Counter/to-Zero/Flatten to your favored attack. What’s good about it: As an ACE, it pulls its weight in utility by providing any two cards from the deck and effectively making trash costs—or opposing trash strategies, null. You get a full deck, a full hand (some of which is picked), and to setup part of the deck going forward. It’s a great preparatory tool for the transition into late game. And if willing to give up on the huge effect of a late game deck refresh, it can still be used to refresh the hand and pick any 2 early on, which in some cases can be more effective earlier game. What’s bad about it: You don’t get to keep your current hand. It’s not always a bad thing but it’s worth noting that it will reduce its efficacy window if you have to give up other critical in-hand cards, then waste some of your 2 picks on those cards again. You can also lose out on the effectiveness of the deck refresh if you haven’t gotten any trash-cost cards or you are forced to play it early. Like Polymorphic Code, you get a hand of 4 that turn; unlike it, Reload is voidable and is your only support for turn. Tips: Once you decide Reload is best for your deck, always try to maximize every bonus it provides. 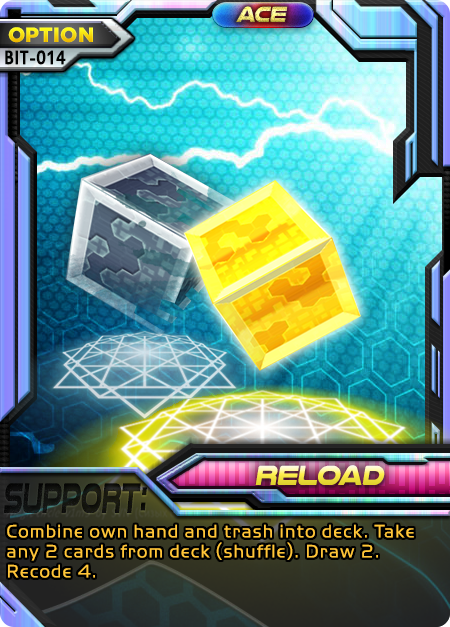 This goes without saying, but it can be tricky if you plan for a deck of trash costs for heavy effects (Mega Chip, Mega Disk, Phantomon, Dark Wings, Giga Cannon, et al) and end up trashing the Reload without any way to recover it. The good news is Reload can be gained back with “recycle any 1” effects. Some evolution boxes will make this a practical ACE search when combined with reckless trashing, which Reload would then erase as if it never happened, effectively making high-trash costs in your deck into ACE-power cards! In addition, cards like Aquilamon are intensely powerful when combined with Reload, since this gives you effectively 5 copies of the Reload for purposes of sequencing: now you’re more likely to draw the Reload earlier than trash cards. Puppet Switch—Setup your hand and DP. What’s good about it: Puppet Switch puts any card in your trash in your hand. 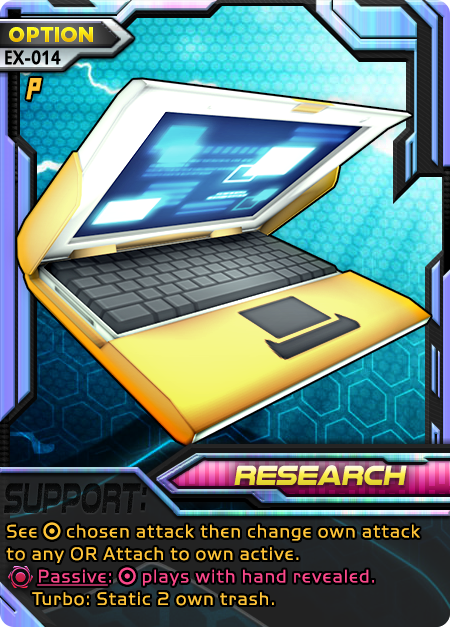 This card is fantastic for reusing powerful cards, and setting up for high DP cost Digimon. Just imagining the possibilities with Ace cards, for instance: you could re-use Warp Dimension, netting you 18 cards of deck damage. Also, since you can change your type, this is usable with an attachment that fell into the trash along the road that your current active zone can’t use. You could change your type to Metal and re-use a Miracle crest to suddenly gain support effects outside of Metal’s domain. You can do almost everything Puppet Switch does with other cards, but it always takes more than one card (and therefore turn) to set up these sorts of scenarios. This is a high-value card that can give players a host of new and unexpected outs. Most opponents wouldn’t consider a clutch Puppet Switch when playing out their turn. The fact that it gets back cards like evolutions or Digimon that were paid into DP means you can get insane DP value for later evolutions. Example: rack a Redotamamon for +40P, evolve, support with Puppet Switch and get back the Redotamamon, then it gives you +10P. By your next opportunity to evolve, you’ll have a guaranteed 50P and a net card advantage of +0. Lastly, a deck with x3 VS against your type can fall apart if you change your type away (plus you’ll net some sweet cards and DP out of the deal). 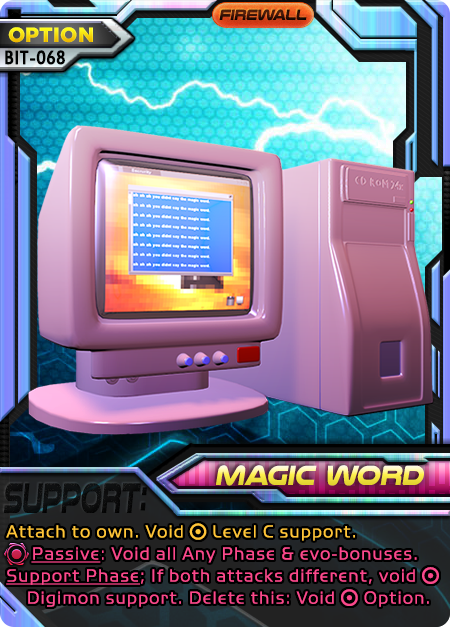 What’s bad about it: This card can’t be charged into DP normally—you have to play it as support to get it there. If you’re not set up for multi-color, you lose one of its effects; and if you are, you need a tight evolution-box line. Tips: If you’re looking to reuse specific cards in your deck, Puppet Switch is a good universal way to do it without splashing into Jungle or Enigma. 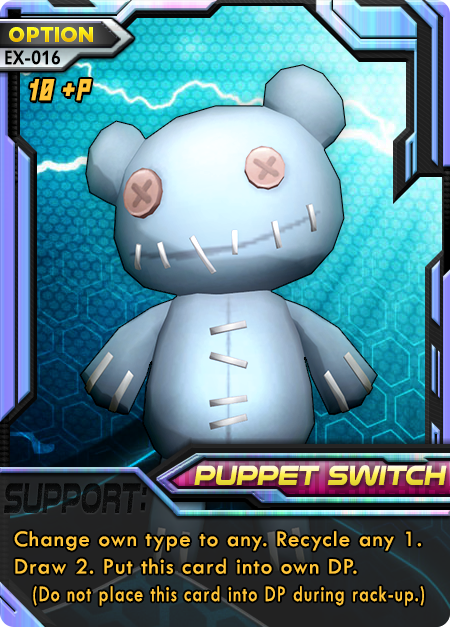 In fact, Puppet Switch is a good way to unlock the potential of your existing cards and therefore provides good universal synergy. Many games can come down to a well-timed Ace play that doesn’t get voided, so Puppet Switch on reusable Aces can give you the edge to win. 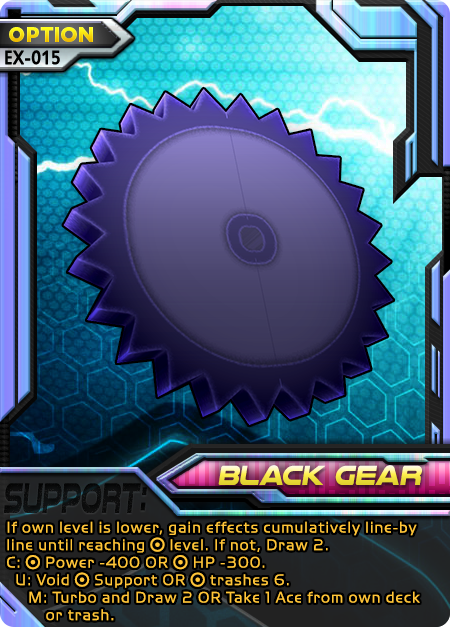 What’s good about it: Black Gear is a protective Option for when your Level is lower. It grants a variety of boons depending on your Opponent’s Level; each as good as or better than other cards. C is better “Heap of Junk” with “Whistle” stacked on top. U is a weaker “Training Manual” plus killing off all their most damaging Power. M lets you immediately refresh your HP, potentially getting as much as free warp from Rookie to Ultimate. What’s bad about it: You get nothing unless you’re behind in evolution. Everything you get is based on your opponent, which can make it more situational. The M-level ability fails immediately if you’re at Level U, and has to be set up prior to supporting. You can’t change your attack if you get to evolve with this. Tips: At first, Black Gear looks difficult to control. The conditional can be easily accounted for by simply using it in a slow-evolution deck,—giving second-evolver advantage while protecting against the first-evolver. A mostly-Rookies deck makes constant use of Black Gear to the fullest. “Whistle”, “Research” and other cards with the same conditional can intersect and strengthen the deck’s overall protection. While determining whether the M-level effect is what you want, consider prepping for it with previously mentioned protective cards, while waiting for a strong ultimate like “Gigadramon” or “Wargrowlmon”, which could end up netting you 2 KOs. Whamon (Level U)—The magic of an Ultimate that evolves from itself. 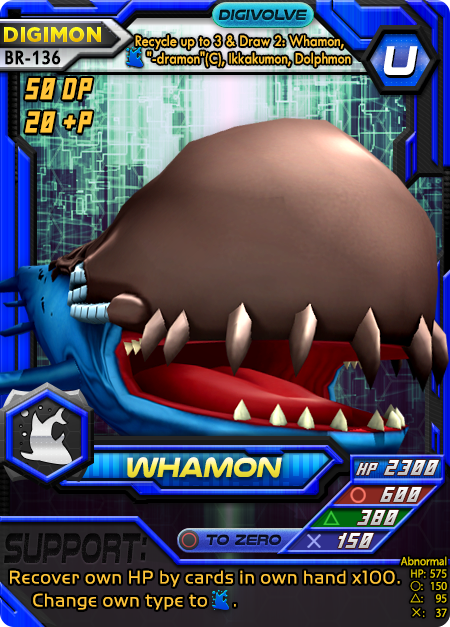 What’s good about it: Whamon (like his Champion form) has the highest printed HP of any Digimon in its level. The Evo-box bonuses featuring “Whamon” push the HP even higher. Whamon in the Evo-box gives this card a built in “Mutate” letting you evolve from U to U if you would like. Its Support ability is also very nice getting tons more HP if you can keep your hand relatively stable. What’s bad about it: This card has low Power—closer to a Champion rather than an Ultimate. Its to zero ability is very under-powered. Tips: Whamon (like most Ultimates) wants a dedicated deck with lots of evolution cards that can supplement its built-in Mutate. Running “Download” as your ace with cards like “level Crush”, “Plugin Back-up” and “Burst Growth” can give you extra effects with your extra Evolution, and keep the Whamons coming. Data Hijack—Evolve from your deck and charge extra DP. What’s good about it: Data Hijack’s primary effect is to evolve to level C straight from the deck. Evolve from deck is bonkers, letting you take full advantage of every Champion in your deck, as long as it’s a legal target. It’s second effect doesn’t require you to evolve, meaning you can use it even if you can’t go up—If that’s the case, the second effect lets you virtually charge twice before Evolving (by DP instead of the primary effect), or reveal the top card of your deck before the support phase. After use, it deletes itself so you don’t accidentally get flooded with this card after recycle effects (this is usually a good thing, since re-using a card like this is rare and requires tricky timing, while it clogs the hand). What’s bad about it: At mid to late game, this card can be rather dull— especially if you are not at Level R or you didn’t have a valid card on the top of your deck (cards with +P). Tips: Data Hijack loses consistency as the game progresses. If you have no other evolution to play and this is stuck in your hand (usually stopping you from draw 2 each turn), consider playing it and checking the top of the deck—at the very least, you get to check your upcoming card. Mixing this into decks with extra Champions or a variety of them can let you toolbox your evolution. Try running with “Shogungekomon”, “Cherrymon” or Champions with a wide variety of evolution-box effects. 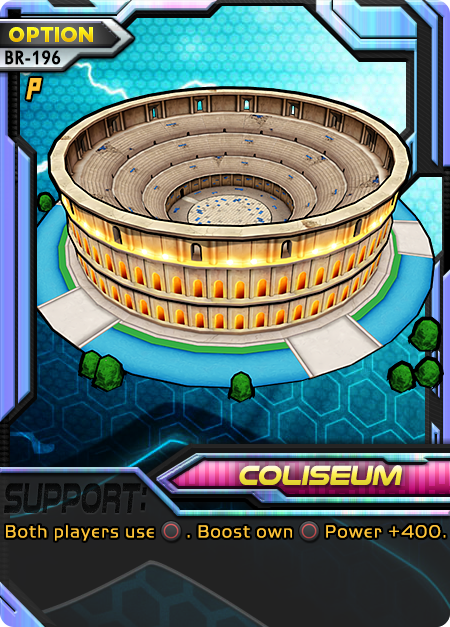 Coliseum—Changing both players attacks to with various bonuses for yourself. What’s good about it: Coliseum boosting your power is very helpful. Forcing a fight can be very necessary when you need to prevent abilities like drain and 1st attack. Especially if you want to use your circle with impunity. What’s bad about it: tends to be the strongest attack for the majority of digimon. the bonus effects aren’t always that helpful at letting your attack happen on your opponents turn. Tips: Coliseum is a tricky card to pin down, its extra effect tends to seem more random than it is, if you can figure out you opponents best move generally you know what effect your going to get. it’s best to use this on your turn when your opponent is most likely to use abilities to get extra damage out or survive to evolve on their turn. In some instances, you can get 200 Power and the change, making it comparable to an Attack Chip without the threat of counter (or “to zero” effects).